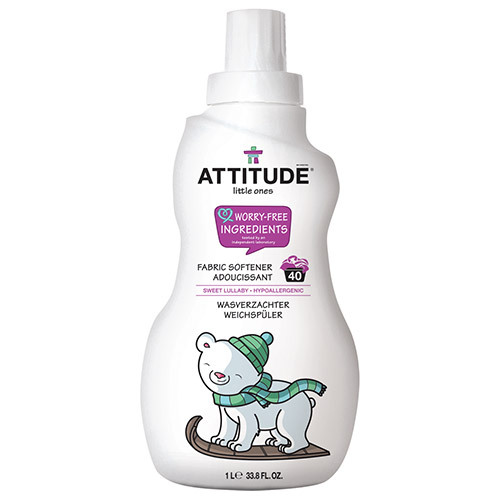 ATTITUDE’s Little Ones Fabric Softener is scented with soothing fruity and floral aromas, leaves fabrics cosy, soft and ready for dreaming! The 100% safe and worry-free formula uses plant- and mineral-based, efficient and hypoallergenic ingredients to freshen fabrics. ATTITUDE are on a journey to (re)discover the beauty in the mundane, nature`s marvels and the incredible mysteries that go unnoticed in our every day lives. With a child-like sense of curiosity, it`s like experiencing the world for the first time - every time. Aqua/water (>30%), vegetable cationic surfactant (Bis(acyloxyethyl) hydroxyetyl methylammonium methosulphate esterquat) (5%-15%), methylbenzyl acetate (sweet fruit) (<5%), methyldihydrojasmonate (jasmin) (<5%), ribes nigrum (blackcurrant) seed oil (<5%). Add to dispenser or to final rinse after tub has filled with water. Do not pour directly on fabric to prevent stains. Always check labels for special instructions. It is recommended to avoid irritants or exacerbating factors (such as harsh detergents, solvents or acidic foods). 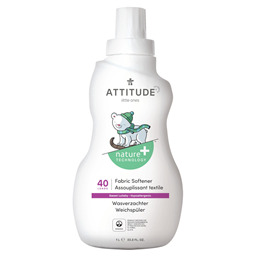 Below are reviews of ATTITUDE Little Ones Fabric Softener Sweet Lullaby - 1L by bodykind customers. If you have tried this product we'd love to hear what you think so please leave a review.